Boggle is a registered trademark of Hasbro, with whom this website is in no way affiliated. 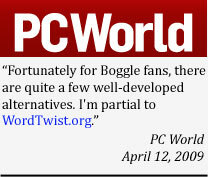 Wordtwist is an online variant of traditional Boggle, with different rules of game play and board distribution. If you are looking to play traditional Boggle, please visit www.hasbro.com. If you love this classic word-finding game, you've come to the right place! At WordTwist you'll be able to play competitively against more than 100,000 players from around the world. We've retained many of the same basic rules as the popular board game in this online variant, but with a few key twists in terms of scoring and letter distribution. What's more, users who opt to register an account will have all their games tracked and scored in our ongoing competitions. The top players will be listed in our Wordtwist hall of fame. The purpose of the game is to discover as many words as possible within a jumbled square of sixteen (4x4) or twenty-five (5x5) randomly selected letters. A valid word can only be formed if each letter is contiguous (i.e. side-by-side, above or below, or on the diagonal) with the next, and no letter position can be used more than once in any given word. If you look at the sample board at the top-right corner of this page, you'll see we can spell the word SUPER by starting with the S, then going diagonally to the U, then up to the P, diagonally to the E and finally, diagonally to the R. We could also make the word SPURT starting from the same title, but note that we could not make the word SPURTS, because the only contiguous S has already been used at the beginning of that word. How are these games scored? There are three criteria that determine the final score of any given word. The base score is determined by the word's length. Words that are 3 and 4 letters long have a base score of three. Five letter words are worth 4 points, Six letter words are 5 points, and onwards and upwards, one additional point for every additional letter. But we also factor in how common each word is in the English language and give bonuses for rare and unusual words. Finally, smaller bonuses are given for words which incorporate difficult letters such as Q, Z, X, J and K.
What dictionary is used on Wordtwist? We rely on the standardized SOWPODS dictionary for all words considered valid on Wordtwist. On top of that we cross-reference it with a constantly-updated frequency-of-use wordlist to determine which words are in common or wide usage, and which are in rare and "ultra" rare usage. If you'd like to increase your scoring abilities, there's no better way than to familiarize yourself with our list of all valid 3-letter words in SOWPODS.